Perhaps a more appropriate title for this post would be I Can’t Believe I’ve Never Made This At Home Before. Ham. Egg. Chips. One of my most favourite indulgences ever. There is something deliciously childish about dipping your chips into the runny yolk of the egg. And then mixing those flavours with the sweetness of the ham. It’s a dish that I’d sort of forgotten about over the years. I used to have it all the time for my staff dinner in The Walpole in London, when I worked there nearly 10 years ago. I had a wonderfully comforting plate of it for lunch at The Old Stand on Exchequer Street. And then a more flamboyant version at L Mulligan’s Grocer, which came sitting atop a grilled pineapple. And then it struck me the other day. I’m an adult, capable of making my own decisions and choosing what I want to eat. Why have I never made this dish at home? What on earth was I waiting for?! This was so ridiculously comforting eaten at the old-fashioned Irish dinner time of 2pm, washed down with a mug of tea. Your enjoyment of the dish will depend on the quality of your ingredients, as it does with all simple dinners like this. So try to get the best gammon steak you can get your hands on, maybe at your local butchers or from Crowe’s or Hick’s. I followed Barney Desmazery’s recipe for the chips. The result were the most addictively smokey chips I’ve had in ages. Perhaps ever. I didn’t follow his method of par-boiling the chips as I, well… I was too lazy. It is worth following his method, however, as the way I do it, a lot of the chips tend to fall apart. They still taste amazoface though so it’s totally up to you. The addition of the pineapple just brings this plate of old-fashioned nosh together, giving it a bit of 1970s class. Pre-heat your oven to 220C/fan 200C/Gas Mark 7. Start by making your chips. 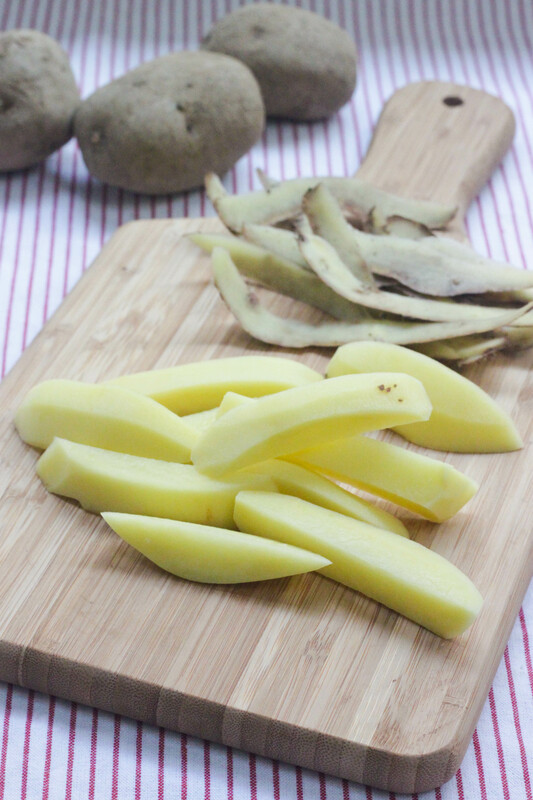 Peel and wash the potatoes and cut into chip-sized wedges. Put them into a roasting dish. Drizzle with a healthy amount of olive oil – two to three tablespoons – and then sprinkle with the paprika, cayenne and a good pinch of salt. Cut the bulb of garlic in half and place the full half in the middle of the chips. 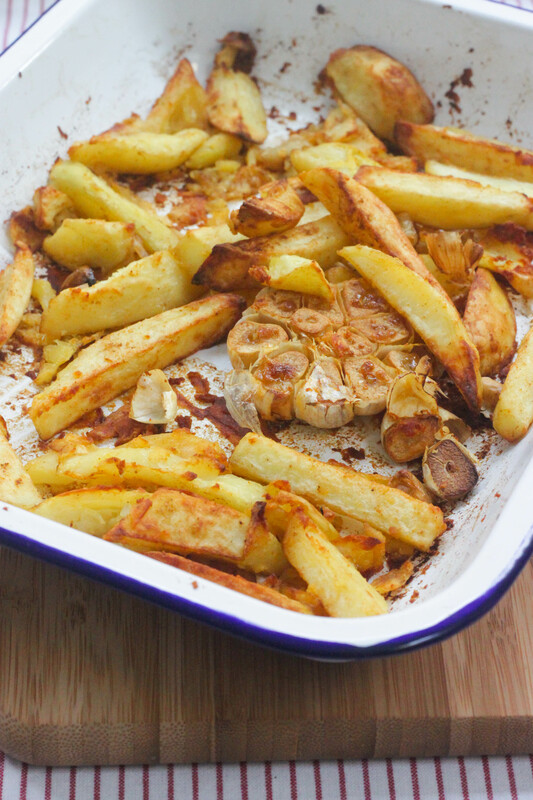 The other half might fall apart so just scatter the pieces of garlic, skin and all, around the chips. Mix everything well so the potatoes are evenly coated. Put them into the hot oven and roast for at least 40 minutes, checking a few times to make sure they’re getting evenly golden. Add another drizzle of olive oil halfway through as well. Remember, they will fall apart a bit if you don’t par-boil them but they will still taste lovely and there’ll be lots of amazing crispy bits to scrape off the bottom of the dish. When your chips are nearly done, heat a griddle pan (or a large frying pan is fine) over a high heat. 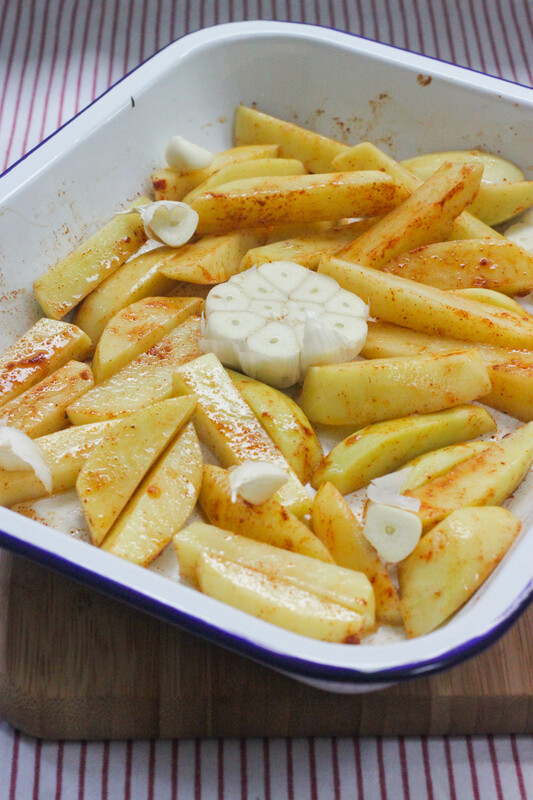 Drizzle with oil and cook the pineapple rings until they have lovely golden marks on them, about 5 minutes on each side. Set them aside in the oven to keep warm. In the same griddle or frying pan, add a little more oil and cook the gammon steaks for 6 to 10 minutes on each side until cooked through. Set them aside in the oven to keep warm. Your chips should be ready now. You can discard the garlic, but try to set it aside for later. Roasted garlic is so delicious, it’d be a shame to chuck it. I used it in a soup I made later in the evening and it was glorious. Turn down the heat in the oven to keep everything warm while you fry your eggs. Meanwhile, fry your two eggs in another smaller frying pan. 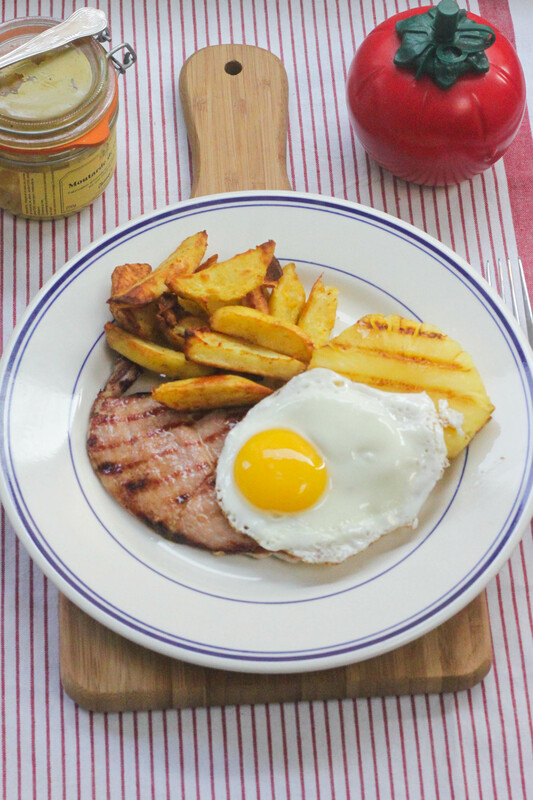 Serve the ham, egg, chips and pineapple along with mustard and ketchup. And don’t forget that mug of tea! Let’s have another look, shall we? Phwoarrr! Something about this dish makes me feel like getting my London cockney swag on. Not quite sure what that is but I’d say it’d be suitably soundtracked by Herman’s Hermits’ 1965 No 1 I’m Henry the VII I Am. Or maybe that’s just me. Gammon & pineapple. My favourite retro food ever. 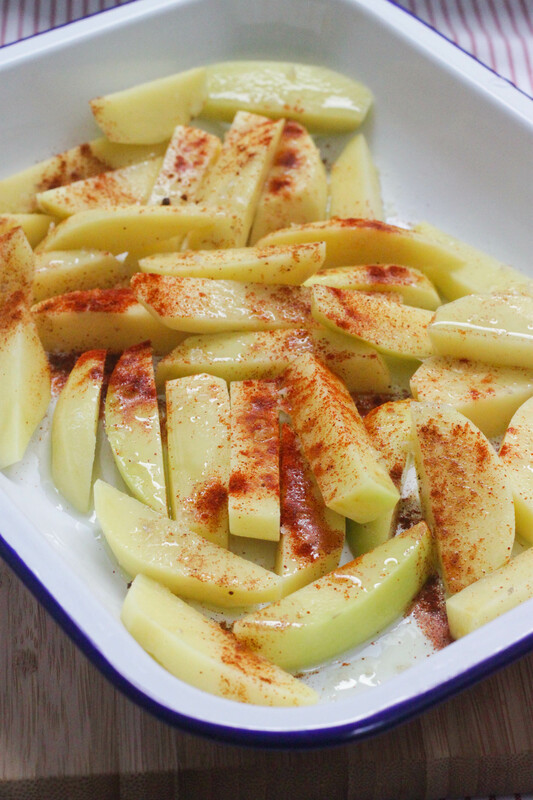 Must try those chips too – fab post Aoife! Wow, this does look delectable! Haven’t done the ham & pineapple together… must be a Scots thing? Ham and pineapple is a worthy combination that must be tried. Have you never even had the combo on pizza? It’s so good! Hi, yes, Aoife, definitely on pizza… but not ever with egg and chips… a gap in my experience which I plan to correct asap thanks very much! i would really love this for my lunch right now. when i moved to dublin there was a cafe on the corner of wicklow street, not far from our new office that did the most amazing egg and chips, yum! I’d actually love it for my lunch again today, Angela! So comforting. 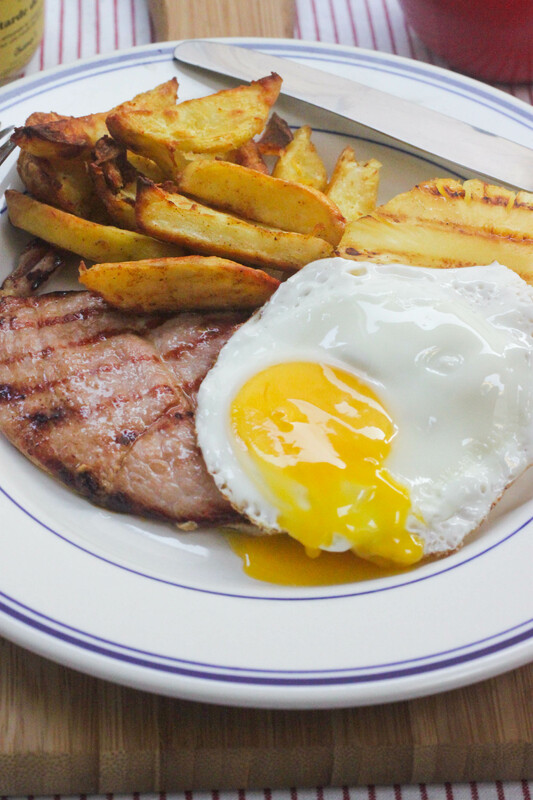 I found The Old Stand’s ham, egg and chips to be really good. So you could head there for your lunch today! Really want one of those dishes you cooked the chips in? Love the aerial photo – we are orbiting planet fried egg…. The dishes were a brill Chrimbo pressie from Niall, he got them from Blackrock based Makers & Brothers. Lovely shop! Love, love, love. 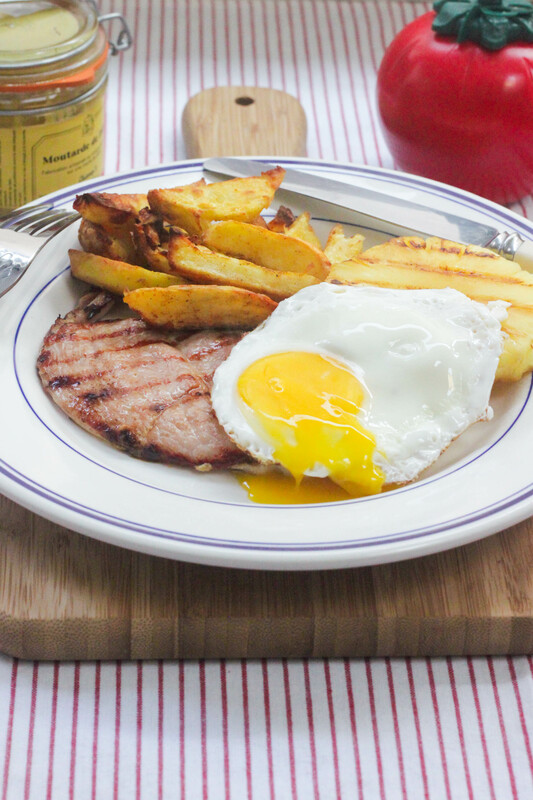 We used to have cold ham, egg and chips of a Monday as kids – a great way to use Sunday leftovers. Did you get the gammon in Ennis’s perchance? I still haven’t been! Hi Annie – I thought you’d never had ham and pineapple together, full stop! Phew! Well, definitely give it a go with the ham, egg and chips. It totally works! When I started cooking in my early twenties I had a favorite gammon steak with mustard and honey. This brought me back with a bang and was pretty delicious. Thank you. You’re welcome, Garry! It’s such a comforting dish, and such a simple one to put together. Oh my goodness that looks amazing. Amazoface! Heh heh! Thanks Ben. It was pretty amazoface, if I do say so myself. Hello Aoife…Made it for lunch yesterday and it turned out really delicious! Didn’t make the chips, but used some fresh crusty bread for “mopping up”….Will make the chips part another time. Like the idea of the garlic. What I would do with that (as it’s soft and sweeter) would be to whisk it with some cream and make a dip. Me again! !…That should have read freezer, not fridge!…. Hi Maureen, thanks for saying hello. I *LOVE* the idea of turning the roasted garlic into a dip. What a brilliant idea. Definitely doing that the next time! Be sure to give the smokey chips are whirl, they’re a winner. :I precisely dersied to thank you very much again. I do not know what I would’ve taken care of in the absence of those advice documented by you over that situation. It seemed to be a real distressing circumstance in my position, however , being able to see the skilled style you treated it took me to cry over happiness. Extremely happier for your assistance and thus believe you find out what an amazing job that you are putting in training the rest with the aid of your web page. Most probably you haven’t come across all of us.